From Goodreads: Sometimes danger is hard to see... until it’s too late. I really enjoyed this one. I read it in one sitting and couldn't wait to find out what happens. Having recently read Dangerous Girls by Abigail Haas I've come to the realisation that I don't have to like the main characters to enjoy the story. 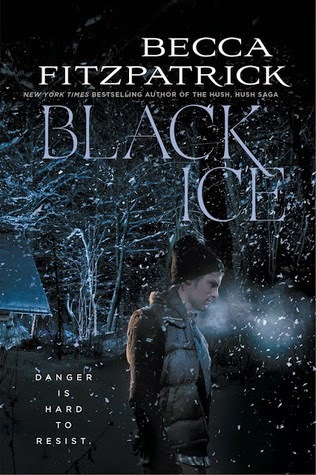 Which is a good thing as I started Black Ice pretty much hating all the characters! Britt was just a tad too spoiled and entitled, her best friend Korbie was seriously annoying and I disliked Calvin from the get-go. However, I did like Mason the first time we met him (his introduction made me laugh! I was so sure Britt was going to get caught out) and Britt completely grew on me as the story progressed. I love stories that have a personal journey for the main character and I really enjoyed reading about how she was so reliant on everyone else and suddenly she'd in a situation where she not only has to fend for herself but actually save herself. I really like Becca Fitzpatrick's writing style - just like her Hush Hush series it kept me completely gripped. I did find some aspects of the story a bit predictable - or at least I thought I did but then I doubted myself quite a few times - but I loved how it all unfolds. Did some of Britt's decisions annoy me? Hell yes! But that was part of what kept me entertained. I also like how this one ended. I don't want to say too much but I did really like it. I'm looking forward to reading whatever Becca FItzpatrick writes next. I had heard very mixed reviews on this novel, but after reading your review I decided to go out and grab a copy. I'm only 50 pages in and I'm really enjoying it. Thanks for the review. I have to like the characters in a book I read (or at least sort of like), so it is good to know that Britt gets better! Thanks for the review, I might check this one out after all...So many mixed reviews! Sounds like a good book, not usually my reading style but I think I'll give it a go! Also, I've nominate you for the 'Versatile Blogger Award' - check out the details on my blog!